Today I am showing you a fun dress that is perfect for Valentines Day! I picked up this Julie Brown dress at Goodwill for $7 and it still had the tags on it for $110!!! It is not something I would normally be drawn to, but for the price, I thought I could at least try it on. 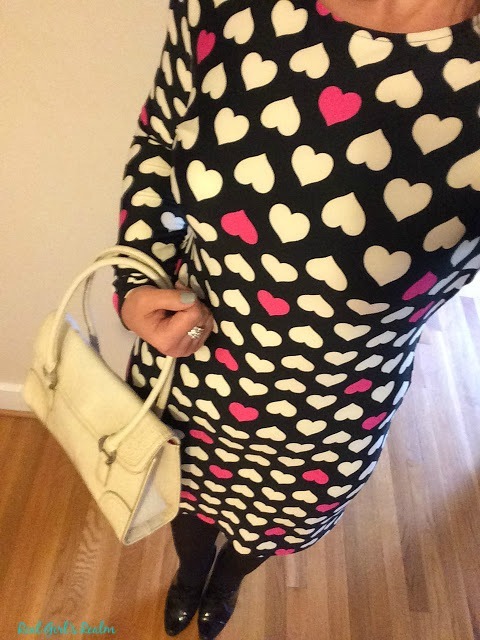 I was pleasantly surprised that the fit was perfect and the heart print is super cute! 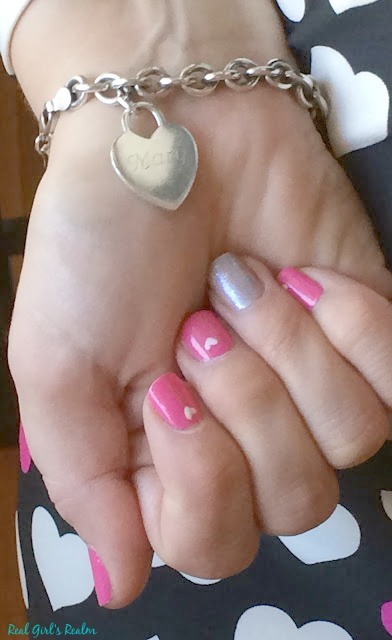 I also did a fun pink manicure with white hearts and a glittery accent nail and accessorized with my personalized Tiffany style heart bracelet. 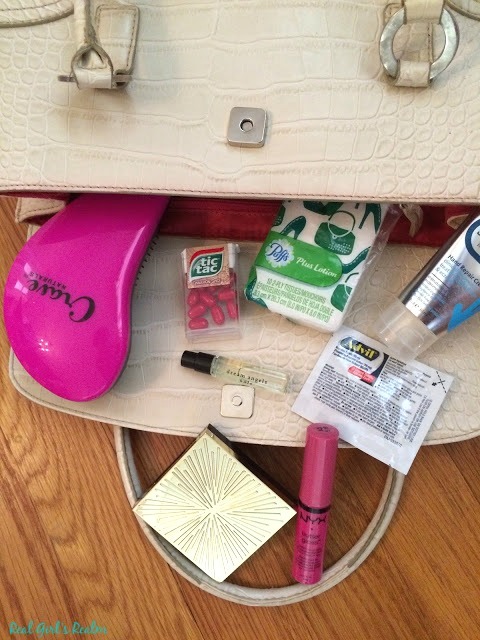 My Tommy Hilfiger purse from TJ Maxx (aff link) is even lined with pink to keep with the Valentine's theme! Do you have a date night outfit planned for Valentine's Day? If you want more Valentine's Day Inspiration, check out these yummy Heart Shaped Cookies over at The Mixed Bag! Thank you! It was an amazing find! Thanks for sharing my post! Yay! I love Valentine's Day, only because of all the heart shaped things that happen! Anytime! Thanks for sharing mine! I love hearts too!!! Isn't it great when you snag a bargain like that. Wonderful! Yes! I love finding things like this as Goodwill! How lucky! I never have such luck in charity shops! Its definitely hit or miss! I lucked up that day, but other times not so much. I think the fun is in the hunt! Thanks for reading and commenting! How adorable is that dress! I love it! Thank you so much! It is a fun dress! Wow- what a bargain! Great print too. That dress is so cute! I love the colors and print! All your heart and pink accessories are adorable! Thank you! Its fun to go all out for Valentine's Day. Thank you for reading and commenting! It was a lucky find! That dress is darling and such a great find! 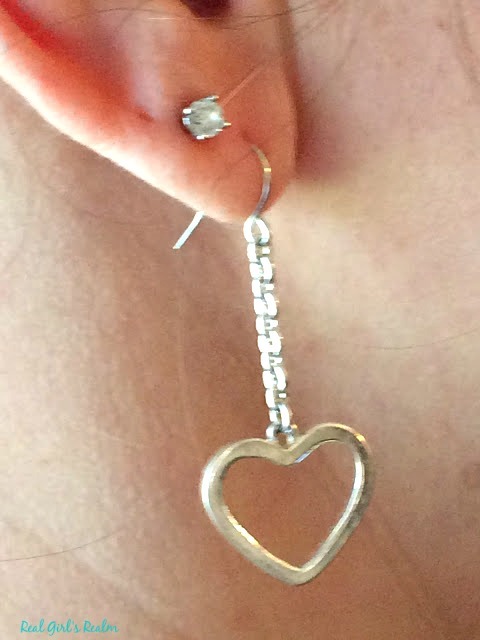 I'm also loving those earrings! I can't believe you found them at Cracker Barrel! Thanks for your kind words! I love Cracker Barrel; you can definitely find some unique items there! Very perfect for V-day! Love it, and such a good deal! Thank you for reading! It was a great deal! Thank you so much! I love doing fun manicures!